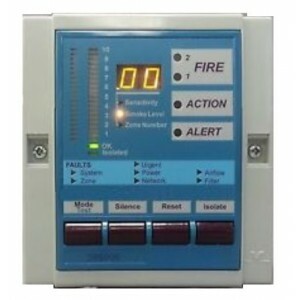 The Display Module can be mounted into a detector unit, a remote mounting box or a 19in sub rack. Several displays can be configured to display information from a single detector in multiple locations. There are various versions of the display module depending on the type of detector and the relay configuration required. The LaserSCANNER display has a fourth mode for the Numerical Display which shows the First Alarm Sector(FAS), this being the number of the sector (pipe) that has detected smoke. For the LaserCOMPACT the Fire 2 LED is omitted. Smoke levels are continuously shown on a bar graph display where each illuminated segment indicates the current level of detected smoke. The top segment of the bar graph indicates the Fire 1 smoke threshold level and each segment below that level represents 1/20 of the Fire 1 smoke threshold level. To the left of the bar graph are the Fire 1, Action and Alert smoke threshold indicators. At a glance these provide a visual representation of the programmable alarm thresholds showing how close the smoke level is to triggering the next level of alarm. 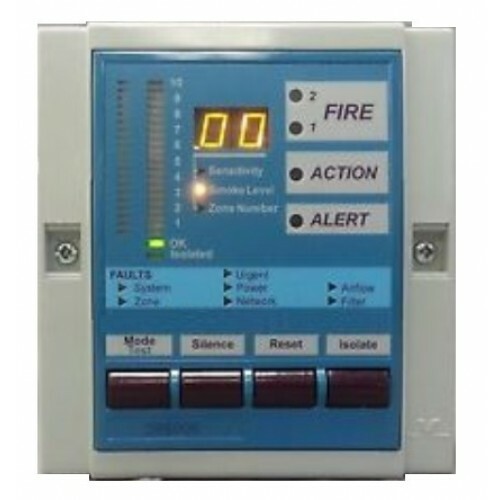 High intensity flashing LEDs provide a clear indication of the fire condition and are accompanied by an audible warning appropriate to the alarm condition. Similarly, any fault condition is indicated by a series of LEDs and an audible tone providing a comprehensive range of status information. The audible warning is easily silenced by pressing the Silence button at which point any flashing LEDs are illuminated until the cause of the event is identified, rectified and the system reset. Four large tactile push button keys enable users to reset, isolate or silence the detector and control the mode of the display module. The buttons can be disabled to prevent operation of it's functions. A lamp test routine is initiated by pressing the Mode key for two seconds. A Manual Scan can be initiated on the LaserSCANNER by holding the Silence button for 2 seconds. Provides Immediate Status Reporting for a Single VESDA Zone. Allows Zone Control of Assigned VESDA Detector. 20-Segment Vertical Bar Graph Display. Built-In Sounder for Audible Warning. Multi-mode Numeric Display (defaults to smoke obscuration).